I had wanted to go to Corby Town for quite a while. Not only had I not even been there to take pictures, let alone a game. But they also had a well-regarded programme shop, and there is nothing I like better than trawling through boxes of old programmes, looking to find some gems. Initially, I was looking at doing a midweek game, but then I noticed they were at home at the same time as Wycombe were at Northampton. I had been to Sixfields plenty of times and it was a pretty uninspiring place. And it's geographical location meant that I could drop mates off at the game, and then go to Corby. It was a win-win situation for all - they got a cheap lift and I got some help with the petrol money to try and combat the ever spiralling cost of this season. I have spent over £700 so far, and this would be my 49th game of 2012/13. On the day I was working till 11, so after getting changed and going back to Paul's, we were away by 11.30. After dropping the lads off at Sixfields at 12.30 I made my way to Corby, just over 20 miles taking me an hour. After stopping at Stewarts and Lloyds FC to take pictures of the United Counties League Team's ground, and also stopping at Aldi to get some cider for the evening, I got to Steel Park at around 1.45. After walking around the ground and trying to get into their old Rockingham Triangle ground without much success - all I got was wet feet and a load of brambles all over me for my trouble, added to the long walk that I had to take, I went into the ground. After paying £10 to get in and £2 for a programme, my first port of call was the club shop. Sadly, despite having a good range of programmes and books, there was nothing I needed or fancied. And I saw that pennants were on the price list as £10 large and £7 small. But when I went back later to get a picture of the club shop, the prices next to the actual pennants where £5 and £3, so my overwhelming compulsion so cover every square inch of my wall with pennants kicked in and my wallet was £3 lighter. The next place I stopped was the bar. After an annoying drive along slow-moving single carriageways, I needed a pint, and with the town being known as "Little Scotland" due to a large number of people from north of the border coming down to work in the town's steel industry, I was hoping for a nice pint of Thistly Cross Cider. Sadly, it was only Strongbow, but needs must and at £2.60 it was probably one of the cheapest I have had at the footy. 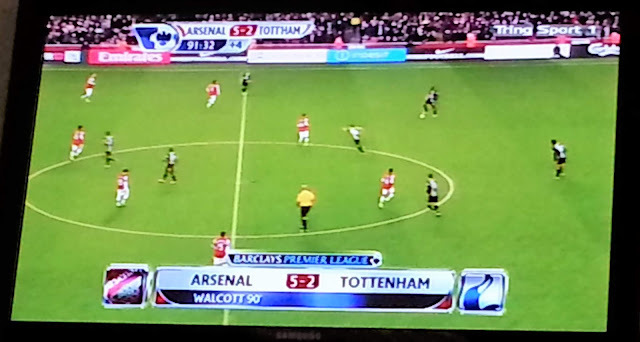 I sat and watched the burning embers of the Arsenal v Spurs game on some random foreign channel, the home side winning 5-2 after Spurs had Adebayor sent off. The final stop before the game kicked off was the excellent tea bar. The prices were a bit more than you would pay in a chippy, but they had a nice range of Scottish stuff. First off I had a square sausage burger with chips and Irn Bru for £4.50. Then about 10 minutes later I went back for a Scotch Pie. I initially thought the "Little Scotland" thing was a bit of an exaggeration or something that had long died out. But practically every single person was ordering the Scottish foods and has a Scottish accent. It felt strange but nice in a way, and I'd not have believed it had I not been there myself. After getting some more pictures, I settled down for the game, choosing to spend the first half behind Oxford City keeper Matt Ingram's goal, who was on loan from Wycombe. The game was not the best I have seen, though it did still have it's moments. 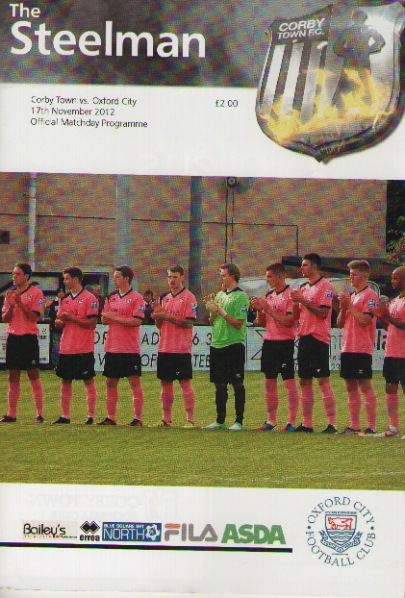 Oxford City had the best of the early play, but it was Corby who had the ball in the net first. On 11 minutes, Paul Malone headed home from a corner, but it was ruled out for a foul. I didn't see much wrong myself, certainly, the player involved won the header cleanly and without impeding anyone. As the game wore on, Corby started to get a hold of the game and have the better chances. So it was slightly against the run of play that Oxford City got a penalty shortly before halftime. That was duly converted and they led 1-0 at the break, continuing their excellent run of away form. During the half-time interval, I discovered that the old ground that I had spent so long trying to access was just behind the dressing rooms and I could easily walk in and get the pictures I required. So I spent the time getting some nice pictures, before returning to the club shop to get that pennant. For the second half I toyed with a number of standing places before taking a seat in the decent sized stand for the rest of the game. The second half started off fairly slowly but as the game wore on both sides had chances. 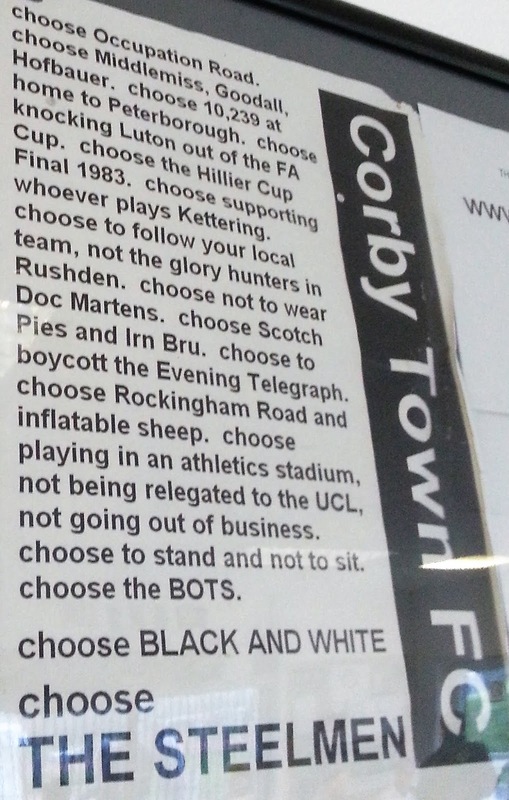 But Corby probably deserved a draw on the balance of play. And they sealed it 8 minutes from time when Carl Piergianni headed home after good play by the home side. The game ended without either side seriously coming close. I made a quick getaway and was back at Northampton by 5.45. After stopping to go to the toilet, I picked up my mates and after dropping them off, was back home by 7, ready to have my usual Saturday night routine of dinner, a few cans and Match Of The Day. STEEL PARK is a new ground on the non league circuit, having been built in the last couple of years. Certainly, it is a lot better suited to football than their old athletics home.2 sides are just hard standing. There is a decent sized terrace at one end and a fairly large stand along one side, holding around 500. With today's attendance of 299, all fans can sit or stand where they want in comfort. 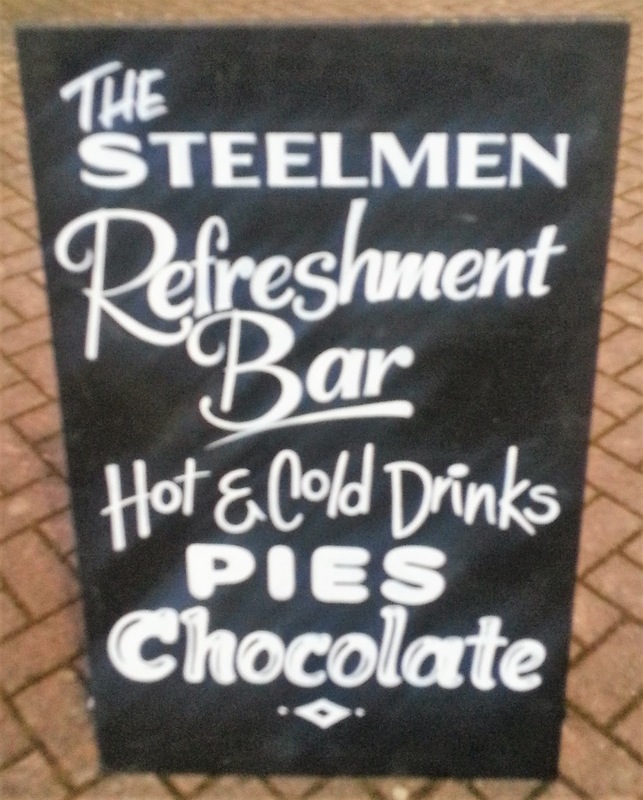 As mentioned above, the tea bar and club shop are decent, while the bar serves it's purpose. It's quite out in the sticks, the ground that is, so a visit to the town beforehand may be an idea if you want more choice, sadly I didn't have time. I'd certainly recommend a visit here, with the Scottish connections, it's something different and unique from other places.